Generally any project system includes the set of tools, techniques, methodologies, resources and procedures used to manage a project. It aids a project manager in effectively guiding a project to completion. The project tool kit content is vary depending upon the application area, complexity of the project But there are the basic moments which are present at each project. So should be and a basic tools, helping to carry them out. This issue introduces the sampled scenario that describes the advantages which provide the application of ConceptDraw products as a tool kit for project management by the example of billing software development project. Brainstorming and mind mapping techniques are used at all stages of the project to encourage creative thinking and solve problems. Software such as ConceptDraw MINDMAP has a number of advantages over the traditional methods for recording ideas such as flipcharts or whiteboards. The powerful functionality of ConceptDraw MINDMAP allows user to sort, structure and analyze information. A map created using ConceptDraw MINDMAP can become a visual "explanatory note" for project. These qualities transform ConceptDraw MINDMAP into a powerful tool for project management. ConceptDraw PROJECT allows you to present any ideas proceeded during brainstorming session in the form of a working project. With ConceptDraw PROJECT you can accurately determine initial project scope, available resources, plan tasks and make resource allocations. You see a clear plan of the tasks that need to be accomplished, and understand the relationship between tasks in respect to time and resources used. Estimating work and managing schedules is a project management core competency. To make a good project plan you should state your intentions as fully as possible as you work major tradeoffs into a plan. Then in later stages of the project’s execution, when different factors make their influence on the project running process, and you need to revise some activities, the plan will help you keep enough discipline to not raise project risk by cutting out activities that you should do during initial planning moments. With the help ConceptDraw PROJECT you can get cost-effectiveness and timeliness data, being able to review, revise and adjust your plans to get successful results. Usually Unified Modeling Language is applied by IT professionals to model computer applications. ConceptDraw DIAGRAM show itself as a comprehensive software tool that can help to integrate UML diagrams into software development process. Each UML diagram is designed to let developers and customers view a software system from a different perspective and in varying degrees of abstraction. ConceptDraw DIAGRAM as a UML Modeling software helps quickly and easily generate all varieties of standard UML diagrams using hundreds of professional ready-made objects and symbols: use case diagram, class diagram, sequence diagram, state chart diagram, activity diagram, component diagram, and deployment diagram. 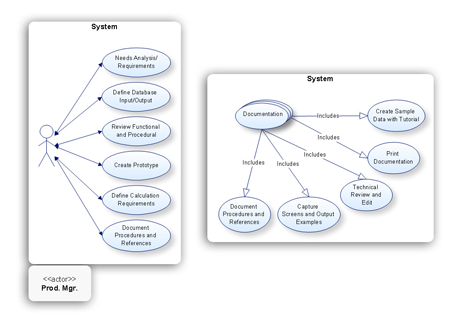 By the way, ConceptDraw DIAGRAM is not exclusively focused on UML – it is a little part of its overall functionality. It occurs rather helpful while designing a whole set of project documentation. Build organizational charts and data flow diagrams, add graphic issues to reports. Project documentation should be more comprehensible for stakeholders. Present ready-to-use documents in one of the suitable formats. You can easily achieve this by using ConceptDraw DIAGRAM huge functionality. Thus you don't need to waste time and efforts, trying to combine different applications into one suite. Use ConceptDraw Products to develop your ideas and plans, to track and manage your projects. ConceptDraw products have shown themselves as a power tool to form the visualization environment for successful project implementation.